Right! All good things come in threes. So here they are - three dolphins jumping out and in to the completely flat, undisturbed "water" stretching all over to the horizon where the all expected CG sunset shows up its face... it’s hard to find something more of a daub, isn’t it? It seems that after a very short-lived DolphinDOS 1 and the immense success of DolphinDOS 2, cool dudes who made it all possible had to face their first difficulties. As version 1 and 2 depended on the presence of a completely unused (all eight bits) 6522 VIA parallel port, this became a major blocker when Commodore couldn’t decide on how to make 1541 less annoying (and potentially less failure prone) with the notorious head banging over the wall of stepper stop. Not only those strange efforts never yielded any well working results in the end (some say quite the opposite) but to make things even worse, remnants of the ill approach took one port bit out of the equation. 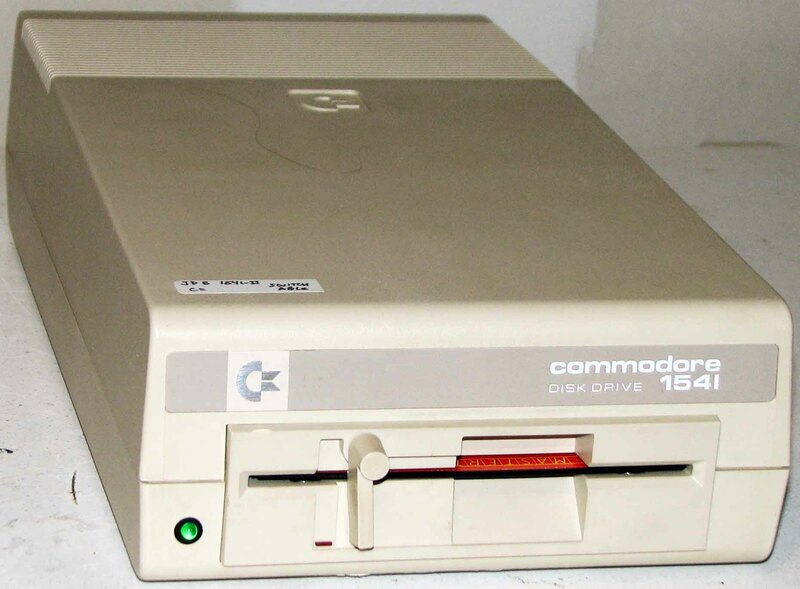 This happened with the release of 1541C (often considered as the worst/least compatible 1541 model ever made) and was then carried over all the way up to the 1541-II. Although that last revision of the device had most of the problems of the earlier incarnations ironed out - it still wastes (has it grounded) one bit of the VIA port, even if the final ROM revision doesn’t need this lameness anymore. This fact led to speculations that maybe some early 1541-II units were shipped still with 1541C ROM contents but I admit I never encountered such combination, nor heard of anyone who did. Everything written in this section about DolphinDOS 2, remains valid for version 3. Even the KERNAL ROM content remains fully compatible. To tell the full truth, I never had original DD3 KERNAL and always used the one, which came with my first DD2 purchase. This tells us that PIA hops on the bus whenever address bus driver approaches $5000 stop, and gets off at $5FFF stop the latest. And of course there is still the ROM IC, which has now full 32KiB available all for itself and happily takes freedom to get on the bus always when A15 == HI alone. Now the question: why so? Why not use the same, proven memory map as in version 2, adding only the PIA below? Of course I don’t know for sure but I think there is an explanation to this. I heard that the guys were thinking of extending their reach to other mass storage devices of the days. If you look at the cover of the German manual, it becomes clear that at least 1571 got a direct hit. With this in mind, suddenly it starts making a lot of sense: in 1571, address space from $8000 to $FFFF is occupied by its ROM. Chunks big enough for 8KiB of RAM lie only below $8000 and above the (residing proudly at $4000) CIA. Hence: ROM over ROM, RAM right below it, and PIA in the remaining space between the RAM and the CIA. Makes sense? Seems so! 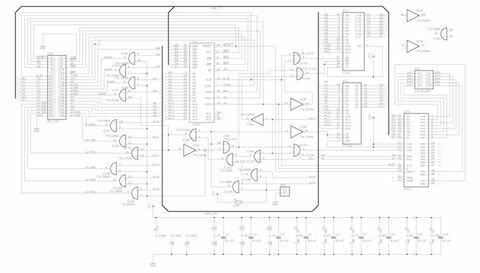 Not only this design made DolphinDOS hardware depend only on the presence of 6502 CPU (regardless of how many - if any - free I/O bits Commodore engineers left unused) but also enabled DolphinDOS 3 PCB to be applied to a whole range of target devices (1541, 1541C, 1570, 1571, C128D, C128DCR, ...) without any modifications! 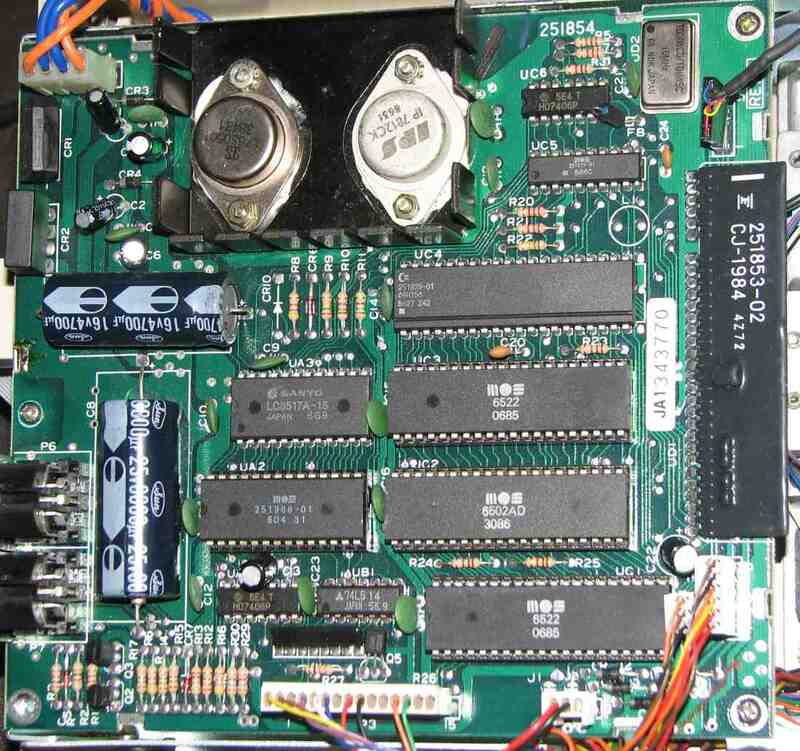 In fact I have one board installed inside a 1541-II drive. This drive was not yet available at the time DolphinDOS 3 was released and still no changes at all were required! 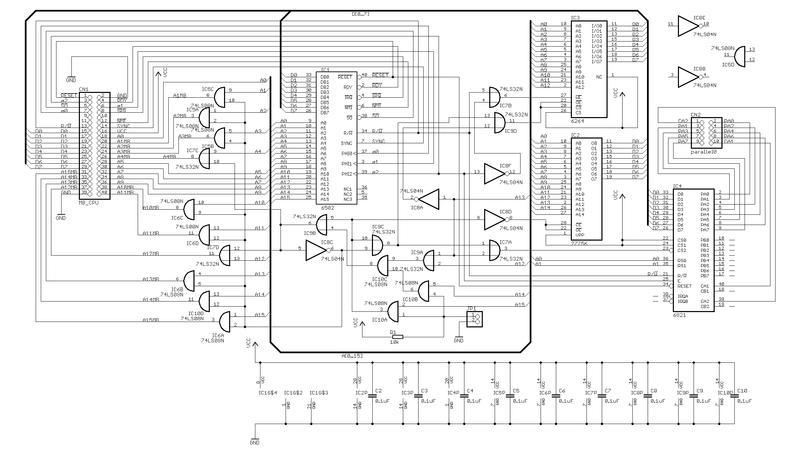 PCB had to grow in order to carry all those additional ICs, and so it did. It became noticeably bigger. To achieve flexibility in locating the PCB inside target devices, it no longer gets placed and connected directly over the 6502/6522 sockets but uses (talking about flexibility, huh?) flexible 40-wire ribbon cable and an IDC to IC socket adapter, which has to be placed in the 6502 CPU socket. As everything, flexibility has its price though. 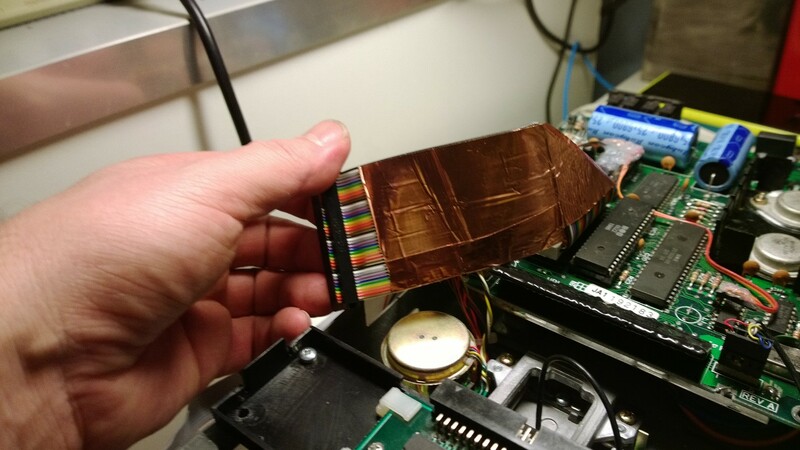 This non-shielded ribbon cable carries now virtually all digital activity of the system over a non-negligible distance. Depending on how it is eventually routed in relation to other electronic components this may become a source of severe headaches! While I didn’t want to just copy the original layout, I have to admit that I found it somewhat challenging to lay the PCB out the way I would be happy with. Even with its bigger routing area, I still couldn’t get fully satisfied with consecutive outcomes. I had to eventually settle down though and the result can be seen above (rev.1a). 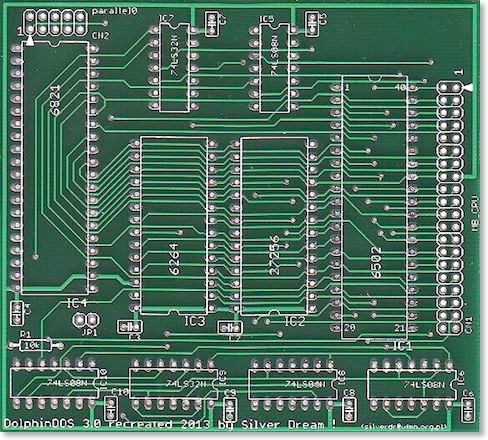 In the download section further down the page, there are GERBER files (rev.1b - minor improvements) available for download, which can be used to produce the pictured PCB. In case you want a ready made one, please check the For Sale section and/or contact me. Please mind where and how you route the cable when installing the board! 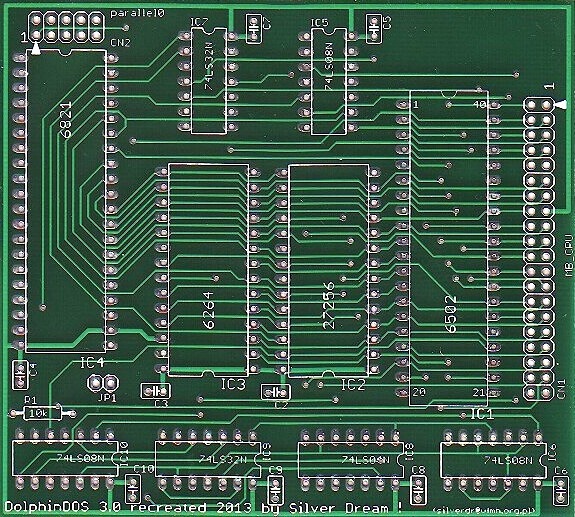 At CBM it was the job of PCB designers to route the signals properly, avoiding unwanted interference. True - there were cases when they didn’t do a good job either but here it is you and only you who have to take proper care of it yourself! 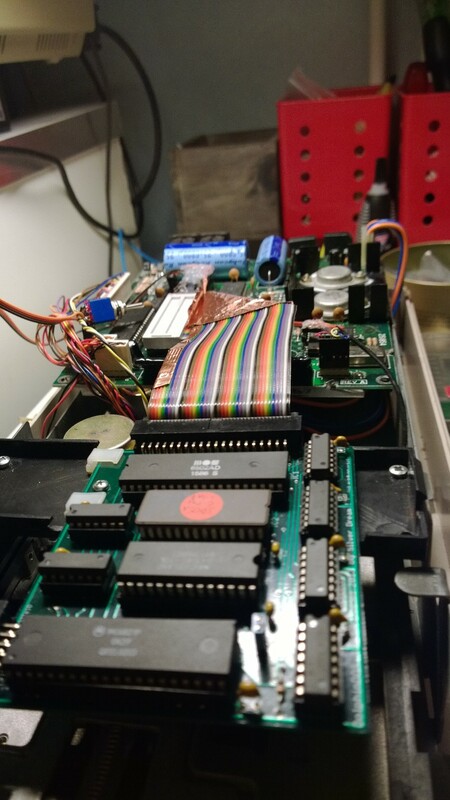 One friend from Finland installed his DolphinDOS3 board in a 1541-C drive (yes, that most loathsome version ;-) He found a nice place for it in front of the controller’s main board, right over the drive’s mechanism. Everything looked perfectly well, but... didn’t work equally well! All kind of read/write errors and complete lack of reliability of operations. The reason? 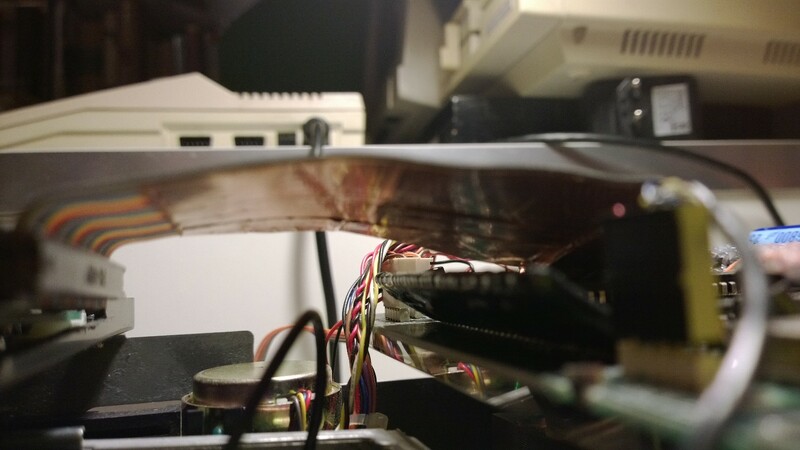 I believe the CPU ribbon cable routed close over the analogue circuits of the drive to be the culprit. I believe that all the digital activity radiating off the cable might have interfered with minuscule analogue currents’ flow. It eventually occurred that wrapping the CPU cable in a copper foil made the problems disappear.